· Virtual Desktop Infrastructure (VDI) Desktop Virtualization is a concept in which a solution based on a server based computing model that is not so different from the traditional terminal server centralized computing model used to deliver applications to remote users. 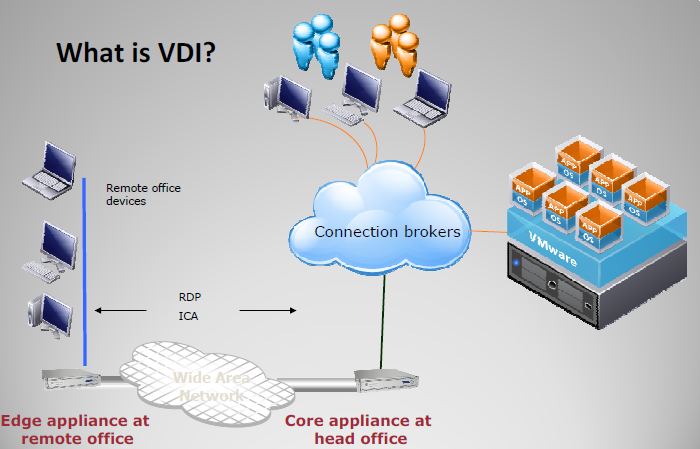 · Virtual Desktop Infrastructure or VDI is the name given to a collection of technologies and processes that dramatically extend the concept of a remote desktop. · It centers on the idea that companies can virtualized their desktop operating systems like Windows XP or Vista using platforms like VMware ESX or Xenserver and run said desktops from within the secured datacenter. 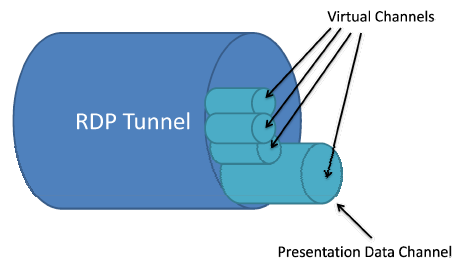 · In this example the user makes use of a thin client device to communicate using an RDP tunnel with his/hers assigned virtualized desktop which is running safely in the secure datacentre traversing through a hardened firewall solution. The result is the user is able to run the applications installed on his/her virtual desktop and access data local to the datacentre. · To make this solution viable for use with Small Medium Businesses and larger Enterprises there needed to be a layer of management between the end‐user and the virtualised desktop to establish and secure possible remote connections. · RDP (Remote Desktop Protocol) is based on, and an extension of, the ITU T.120 family of protocols and as mentioned previously RDP is integrated be default into most windows operating system s.
· ICA (Independent Computing Architecture) is a Citrix trademark and is only available with Citrix products like Citrix XenApp and Citrix XenDesktop. · VNC (Virtual Network Computing) is common throughout the Linux community and there is no reason that we cannot use Linux operating systems as VDI sessions. Some companies will prefer to do that due to cost savings. · Data Security: Keeping data within the confines of the datacenter improves security. · Reduced Hardware Expenditures: Consolidation and reduced upgrades cycles minimizes hardware costs for server and client side equipment. · Easier Management: Perform centralized patching and application installation or streaming without loading the network. · Mobile Workforce: User desktops are portable – users can reconnect from any location with a variety of devices. · Resource Pooling: Server based computing improves a company’s ability to use resources as a common pool.